1 of 3 Using a 2-1/4-inch biscuit cutter, cut out 8 rounds from the middle of the yellow cake. Place rounds on a baking sheet and freeze for 2 hours. 2 of 3 Place cakes on a wire rack set over a baking sheet with sides. Scrape frosting into a 1-quart glass bowl; microwave on high in 10-second intervals, stirring in between, until it's the consistency of heavy cream. Spoon frosting over the top of a cake, letting it run down the sides until it's coated (use a small spatula to spread frosting on the sides of cake). Reheat frosting before you glaze each cake. Once the frosting is set, place cakes on a wax-paper-lined baking sheet. 3 of 3 Cut four 1/4-inch-wide strips of the sour-belt candy for each cake. Place a few dabs of frosting on strips and wrap around the top and bottom of each cake, trimming to fit. Gently press to adhere. 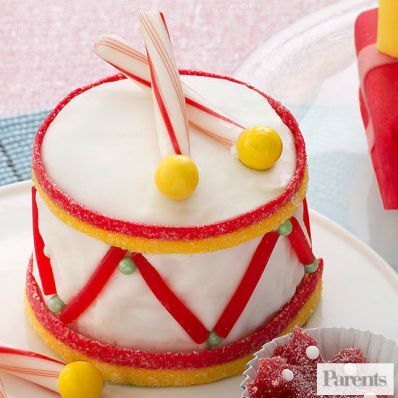 Use licorice and candy balls or jumbo nonpareils to make the zigzag pattern on side of the drums. Break off the straight ends of the candy canes and place them crossed on top of the drums. Adhere a yellow candy-coated chocolate at the end of each stick with a dab of frosting.